These spicy toppings elevate the flavor of this made-to-order casserole dish. Add additional toppings such as sliced olives, sliced mushrooms and chopped onions if desired. Grease an 8x8-inch square baking dish with nonstick cooking spray. In a large bowl, mix cooked pasta with pasta sauce, 1/2 cup mozzarella, pepperoni, peppers and ground pepper. Spoon evenly into baking dish. Bake, covered, for 25 minutes. Remove cover and sprinkle with remaining mozzarella. Bake for an additional 5 minutes or until cheese is melted. If desired, substitute Classico Four Cheese Alfredo Pasta Sauce with Classico Italian Sausage with Peppers & Onions Pasta Sauce. 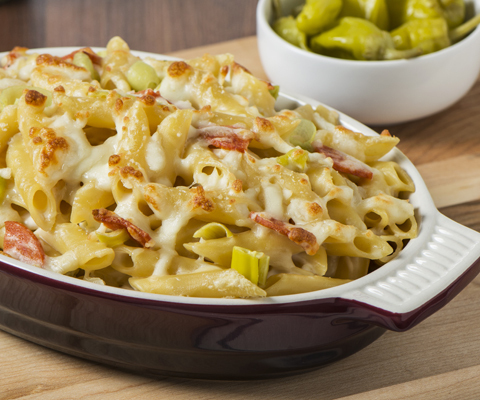 If preferred, substitute mostaccioli rigati pasta with penne pasta. Good flavor but it was dry. Either need more sauce or less pasta. I put black olives and baby portobello mushrooms that I had sautéed in butter and sherry cooking wine on top. That added even more good flavor!